Springtime means more quality time with our pets. There’s just nothing better than a fresh air outing to the dog park, a trip to the beach, or a hike through nature. But, it’s not all kittens and rainbows. Spring can also mean allergies, ticks, bug bites and even injuries as our pets become more active outdoors. So how do you keep pets safe while enjoying all that this special season has to offer? Here are my top three tips! If you’ve followed me for long, you know I’m a HUGE pet insurance proponent. Over the past seven years, pet insurance has saved us more than $5,000 on vet bills for Chilly (so much for mixes being healthier!). Plus, it gives Paul and I the peace of mind that if Chilly or the cats get sick or injured or (God forbid) diagnosed with a chronic illness, we’ll be able to afford the best vet care possible, because we’re covered! Of course, it’s always better to prevent illness or at least detect it early. That’s why I was so excited to learn about Wellness Rewards from Embrace Pet Insurance. This flexible preventative care plan can be added to any accident and illness policy, and essentially rewards you with free money for being proactive with your pet’s health! Pet Parents are given three options for Wellness Reward reimbursement per pet, per year (which can be adjusted each year) including: $250 allowance, $450 allowance, and $650 allowance. This is a great supplement to the Embrace Pet Insurance plan, which covers all of your pet’s unexpected accidents and illnesses, including cancer, ER and specialist care, hospitalization and surgery, diagnostic testing, alternative therapies, and behavioral therapy. And unlike many other pet insurance companies, they even cover breed-specific and genetic conditions, as well as exam fees and chronic conditions such as allergies and asthma (as long as they’re not pre-existing). Embrace also lets you customize your plan to your budget by selecting your annual maximum, annual deductible, and reimbursement percentage. Plus, they offer a Healthy Pet Deductible, which reduces your deductible $50 every year you don’t place a claim for your pet. Best of all, Embrace is easy to use! Just visit any vet, specialist or emergency clinic and then have a staff member fill out your claim form and provide an itemized invoice. Once you submit it to Embrace, you’ll receive rapid reimbursement. 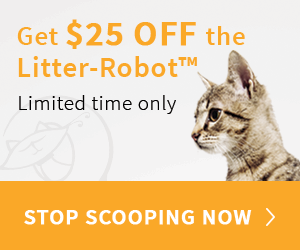 Check out embracepetinsurance.com for more details, information, and a quote! Our home state of Florida is “bug central.” And because we live near the woods, fighting the creepy-crawlies is a never-ending battle. In fact, about 15 years ago, we had a tick infestation in our house! Yes, I said IN. Our. House! Buck or Zeke (our dogs at the time) probably brought them in from outside and at one point, we literally saw dozens of tiny ticks climbing up our bedroom walls! It was like a horror movie! Long story short, we eliminated the problem (after moving out for a week) but ever since, I’ve been uber vigilant about preventing Chilly or the cats from ever having to deal with a tick! Not only are ticks just plain icky, they can carry illnesses like Lyme disease which can infect both humans and pets. In fact, according to CAPC, one in 18 dogs has tested positive for Lyme in the United States, in states throughout the entire country. The CDC reports that tick bites on dogs are hard to detect and signs of tick-borne disease may not appear for 7-21 days or longer after a tick bite. Since vaccines don’t prevent tick-borne illnesses (or keep pets from carrying ticks into your home), prevention is key. Obviously, I’d NEVER spray DEET or other toxic insecticides on my pets. Instead, when we go on long walks, especially in the woods, Chilly wears his Insect Shield for Pets mesh vest and a bandana. Insect Shield for Pets is vet-approved and offers built-in, effective, EPA-registered protection against a variety of potentially disease-carrying insects including ticks, mosquitoes, fleas, and flies. The protection comes in a range of products including reversible beds, blankets, hoodies, t-shirts and tanks, and bandanas and gaiters. The protection is so tightly bound to the fabric that it lasts the lifetime of the product. Even better, the repellency stays in the fabric and does not migrate onto your pet’s skin. This technology is so effective, it’s even been used to protect humans in the Army and Marine Corps, as well as those who work for state governments, Fortune 500 companies, and international relief organizations. Now, you also may be aware that Chilly has skin allergies and every spring, Paul and I dread the day when his skin will break out in a horrible red bumps and splotches causing him to scratch, lick and just be miserable. So far, it hasn’t happened yet, but we’re prepared when it does. In addition to Apoquel (a miracle drug for pet allergies), I have Vetericyn’s Medicated FoamCare Shampoo standing by. 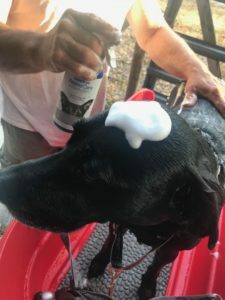 I’ve literally tried a dozen pet shampoos, including several medicated formulas I bought from my vet, but in all honesty, I can say Vetericyn’s FoamCare is my favorite. This plant-based product is sulfate-free, paraben-free, pH balanced, and contains anti-inflammatory ingredients to help heal skin problems like dermatitis, hot spots, itching, etc. Best of all, it actually helps enhance Chilly’s natural immune system against dermatological disorders. Not only does it soothe Chilly’s skin, the pump sprayer and foaming action make it incredibly simple to cover his whole body with the product. No more wasting globs of shampoo, which means it lasts much longer! The coat-specific formulas make rinsing shampoo out of the coat unbelievably fast, saving time and getting Chilly out of the bath fast! By the way, did I mention that the Wellness Rewards Plan by Embrace covers both Insect Shield for Pets and Vetericyn products? That means it’s easier and more affordable than ever to keep your pet healthy, safe and feeling great this spring! Does Your Pet Suffer from Spring Allergies?